A 121-foot-high statue of Mao Zedong mysteriously cropped up in a remote field in China&apos;s central Henan province, as we reported this week. But it seems the homage to the founder of Communist China didn&apos;t have much time in the sun. The golden statue grabbed international headlines, sparking criticism and ridicule. Now, local residents and officials say the statue has been torn down, according to media reports. Images circulating on social media show the tribute to Mao with a black cloth draped over its head and missing parts of its legs and arms. "Public Security officials and groups of unidentified men in olive green greatcoats brusquely turned away visitors and blocked road access to the site, outside the village of Zhushigang. "Villagers said the guards had been sent by officials in Tongxu County, which includes Zhushigang. They said they believed the statue was torn down on orders from provincial officials." It&apos;s not immediately clear why the statue was destroyed. A local resident told The Guardian that he heard "it was because it had occupied a farmer&apos;s land." The newspaper says local media reports that "the statue had not gone through the correct &apos;approval process&apos; before construction." The criticism and ridicule might have had something to do with it. As The Two-Way reported Tuesday, "Henan province was one of the worst-hit areas of what has become known as the &apos;Great Famine&apos; during Mao&apos;s rule, so a statue of Mao in the middle of farmland there might seem like a surprising choice." 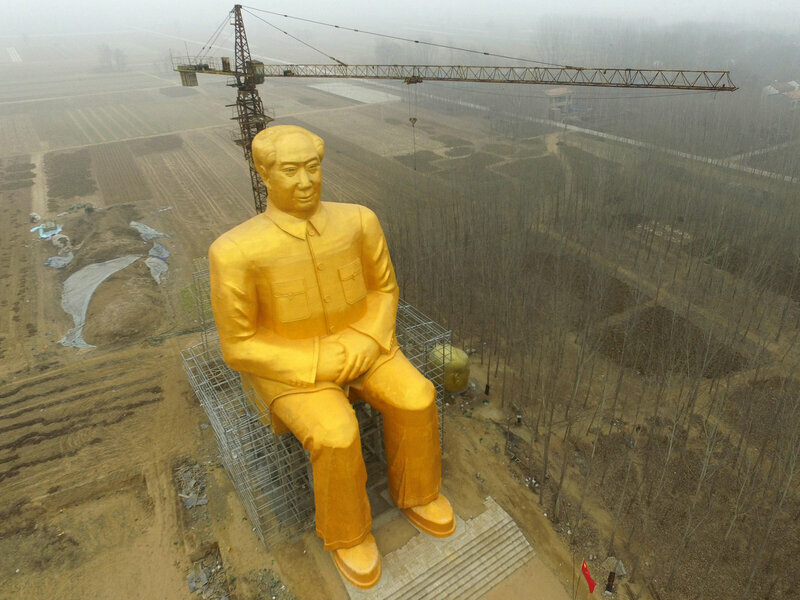 The statue also garnered criticism for its steep price tag — about $460,000 — in the middle of what was once one of China&apos;s most impoverished areas.